Is your stomach fluttering instead of your heart thinking about Valentine’s Day, seeing all the decorations and candy boxes lining the shelves of every store? I can’t count all the people I’ve heard over the years say, “I’m just not a real fan of Valentine’s day. It has never been a fun holiday.” I can understand that. In our culture, Valentine’s day can easily be focused on couple love and romance. And when you are not coupled or feeling the sting or absence of romantic love, it can be painful. But in our family, I like to make it a family affair. 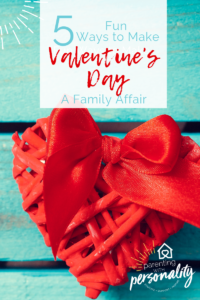 Maybe you’ve never celebrated Valentine’s Day as a family or maybe you have but would like some fresh ideas. This article will provide some fun idea to make this holiday a family favorite! Get your free resources straight to your inbox sign up here! 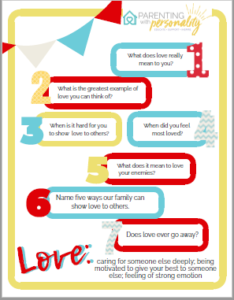 I am including a discussion starter sheet on LOVE and printable Valentine Coupons for you to use for your child this holiday! 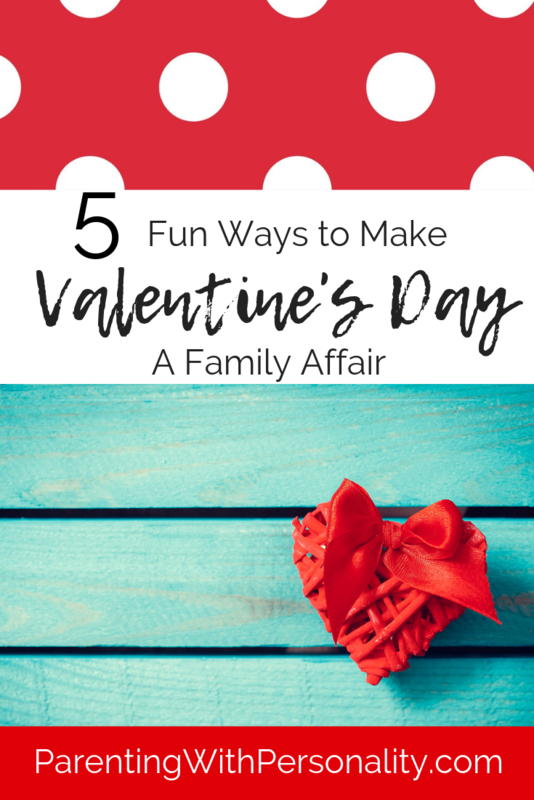 In these weeks leading up to Valentine’s Day, I’d like to pose some ideas you might be able to use as you plan and anticipate making this a family affair and special tradition. It is a great time to slow down after all the large and grand holidays and just focus on the heart of family…LOVE! Love comes in many forms. Love is sometimes easy and fun. Love is often enjoyable. And sometimes, love comes in ways that take more effort or grace. Love can also be a decision, a decision to accept differences, offer forgiveness or extend grace when you’ve been wronged, or learn to disagree but still respect each other. That is love in true form! 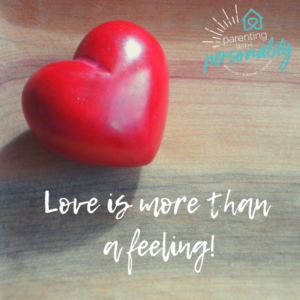 Love involves more than those warm fuzzy feelings. It is far more than a box of chocolates. And it extends far beyond the puppy love that relationships begin with. Love sees someone at their worst and still says, I care, and I am here. Love hears someone utter unkind things but chooses to believe the best, offer grace, and forgive. Love sees someone in their jammies, messy hair, and stinky breath and thinks about their love for them instead. So, this Valentine’s Day, let’s focus more on LOVE in its real sense. The kind of love it takes to be a family, support each other, and join each other’s world. This is LOVE in true practice and sometimes a true choice to do what is right over what comes easy. I’d like to share five easy ideas that can help you enjoy this holiday as a family. How Do I Love You…Let Me Count the Ways! Design a big heart for each family member. You might put it on the door of their room or put a large heart for each member on a door in the main living area. Then as a family, each person takes time to write what you love about every other person on their paper heart. For younger children, help write what they tell you, so they can have their thoughts represented on the hearts as well. Then several times throughout the month, read the things people have shared out loud for all to enjoy. Another variation of this might be to put 52 things you love about your family members in a jar and read one a week throughout the year. In addition to celebrating Valentine’s Day as a family, I encourage you to start a tradition this month that you can carry on throughout the year. It can be a reminder all year long of the love you will share and celebrate, even outside the holiday! My best recommendation for this is the special day plate. 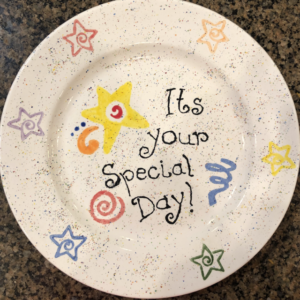 They sell special day plates on Amazon or other online stores, or you might consider hand painting one at a ceramic store. I absolutely loved painting the one we use. It’s nothing too fancy, just a fun family tradition and memory. This is how we use it—The special day plate can be given to anyone by anyone. You give that person the special day plate at meal time. As everyone is eating, you go around the table, and each person says what they love about that person with the special day plate. We have used the special day plate to encourage someone having a bad day, to recognize a birthday or spiritual birthday (the day they asked Jesus into their heart), a milestone like losing a tooth, a special accomplishment, and more. Even our kids’ friends have received the plate when they visited our home and thought that was great fun to hear what our family loves about them. They even start jokingly fighting for who will get it if a group of boys visit together! It’s a great tradition to get us laughing and talking! You might enjoy reading this past article about the 50 Things Every Kid Needs to Hear. 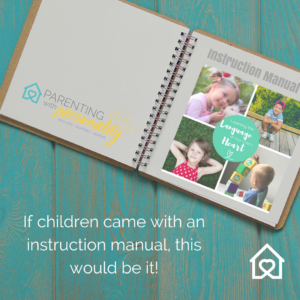 It may give you some inspiring words as you seek to communicate your love to your child! 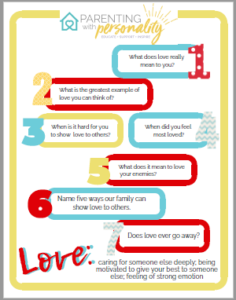 And the handy free printable resource can serve as a great reminder! 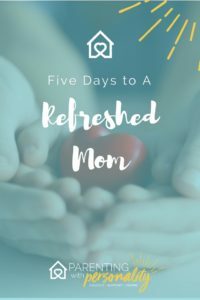 After the fall season, Halloween, Thanksgiving, Christmas, and New Year, we can find ourselves feeling like we are wiped out and ready to just sit and recover! The last thing that we may feel like doing is any kind of decorating. But this can be a fun time to do some easy crafts that can serve as decorations in your home as well. Kids of all ages can find things to do that are creative or fun. Another way that I have simplified the stresses of decorating, is to just find a couple placed in the house that I will focus my effort. Just a few things that are seasonal and serve as that easy reminder of what we are celebrating, a small focal point of sorts! So, in our home, I decorate the center of our long dining room table. I have a long runner and each season change out the candles, small figures, letters, lights, and decorations. Additionally, I put up a seasonal banner in the doorway from the kitchen to the dining room. I don’t have the pressure of doing the whole house, nor the stress of cleaning it all up afterward. (When I did the whole house, I would find seasonal decorations from two seasons back! That didn’t feel fun!) I simplify to focus some fun energy on a couple of areas we see often and can easily appreciate. Home-made decorations can serve as both an activity to enjoy together as a family and a season decoration to put away and keep. You might find the mantle, bookshelf, table, countertop, or a special door in your home that allows you to simply infuse a little holiday cheer in a manageable and easy way! My new daughter-in-law has mastered this beautifully, with sweet decorations she has made from dollar store finds and inexpensive items from Hobby Lobby. By adding sweet touches, she transforms their little apartment into a sweet little holiday haven with decorations on a three-tier tray, across the mantle, on the wall, or on the ledge by their kitchen. 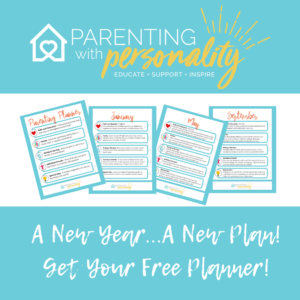 For more ideas, be sure to check out and follow Parenting With Personality Pinterest boards titled Holiday Ideas, Creative Crafts for Kids, and Fun Activities for Kids! Remember, this does not have to be elaborate or difficult to pull off. Just one simple little touch to your holiday might be something fun your family talks about for years! And trust me…even colored pancakes have proven to do that! As I mentioned, and as you might have experienced yourself, Valentine’s is not a great holiday for everybody. What if you were to keep your eyes and ears open to find someone your family might be able to share the love with this holiday? Maybe there is someone who is struggling with being alone. Perhaps there is a family that is missing someone in the parental unit and could be reminded that love can be a family affair! How might you make a difference in the family or life of another? You might be able to invite them to a special meal in your home. If doing a meal feels intimidating or uncomfortable, you could invite them for dessert or deliver them a meal! There are so many ways to adjust our approach to giving and serving to help it feel more comfortable and easier to do! Think outside the box. Don’t be afraid to stretch and grow yourself in this way. It is an important skill that we model for our children and can cause us to grow in the process. 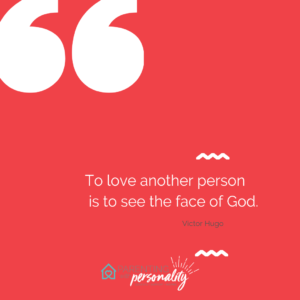 What can you do this Valentine season to make a difference? You have some time to think about it and make it happen! 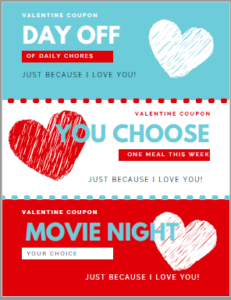 To get you started, I’m including (in subscriber-only resources page) valentine coupons to share with your child. 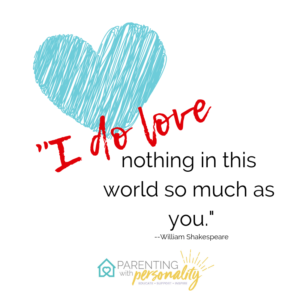 I am including a discussion starter that goes with the free parenting planner for the topic this month, which is kindness. 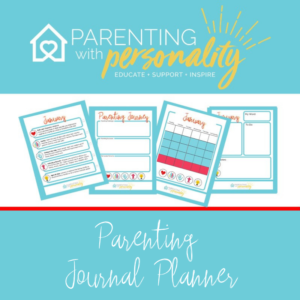 But just so that you have your planning tools I am going to also include the downloadable discussion starter sheet on LOVE, since it is the character trait we are focusing on next month in the Parenting Planner. To receive these great resources, subscribe here and receive a special link to the subscriber-only resources page. 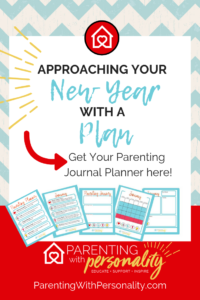 If you haven’t seen the free Parenting Planner or the $5 extended Parenting Journal Planner, be sure to check them out! There are numerous ideas for the coming year as I break down five areas for you and your family in the coming year! Get help in focusing on character development in your child, personal growth for you, ideas for giving and serving, and so much more! If you haven’t heard about the Learning the Language of Your Child’s Heart Online Parenting Course, find out more here! 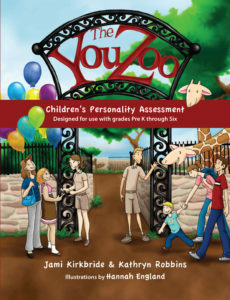 This just might be the new, fresh parenting tool you’ve been looking for, heading into the new year!! 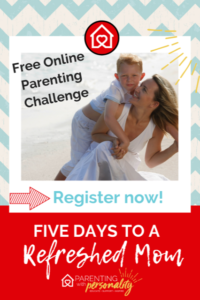 The very popular Free Online Facebook Challenge from last year, 5 Days to A Refreshed Mom will be starting soon! Be sure to go to this link to sign up for updates! You won’t want to miss this!! Over 250 wonderful people like you were involved last year and hoping you will all invite your friends to join us this year! !